Being ready for almost anything is a good thing… even for the minor bad scenarios that might happen in our everyday life. Of course, living today, one of the things that we need to consider for when it comes to being “ready” is the battery juices of our smartphones. Why? Because your smartphone provides almost everything you need whether it’s work related stuff, communication, shopping online, map, etc. That’s why, power banks are here to keep your smartphone’s battery alive and kicking! 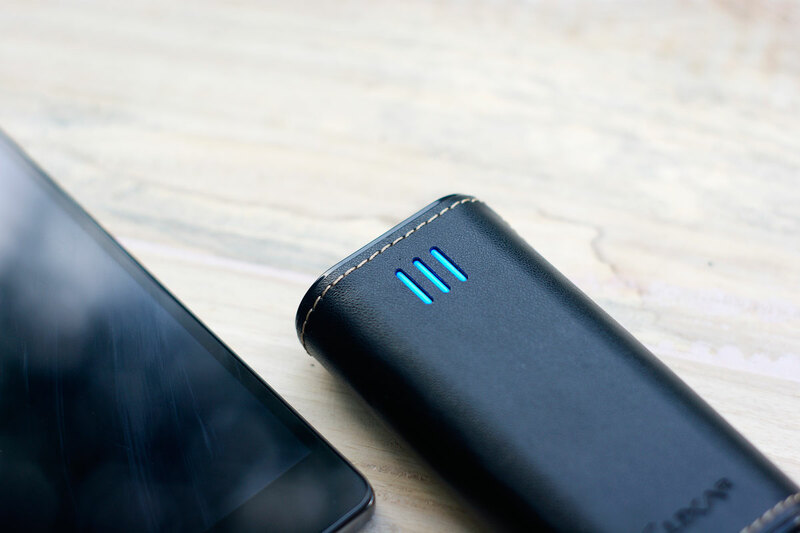 Luxa2 came up with another power bank with style! This is the Luxa2 PL2, an elegant looking power bank that can power up your 2000mAh smartphone up to 2 1/2 times! This power bank may got the style, the power and the light to keep you up in times of emergency! What the hell am I talking about? Then you’re about to find out. As always, Luxa2’s products comes in a simple packaging as they are giving all the glory of style to the product itself. The PL2 comes in a simple black box with a plastic shell that gives you a preview of the product. The plastic shell is embossed with a golden description of the product that boasts its “Fashionistic and Power Combined” characteristic. The back side shows the features of the product. There’s really nothing much here. The PL2 comes with a quick start guide, a micro USB to USB charging cable, and a pouch where you may keep your power bank when it’s not in use. The PL2 sports a leather body which makes it look so elegant and awesome! The size of the PL2 is just right that you it won’t consume much space in your bag or satchel. The PL2 is also light which makes it easy to bring wherever. The logo of Luxa2 will be seen at the middle bottom part of the power bank and the LED indicator will be seen at the top part. The PL2 may only charge one device at a time. Maybe because the whole 6,000mAh is not solely for charging devices since the 2o% of the said power is dedicated for the flashlight which only leaves us to 4,800mAh. The in port is located under the out port while the flashlight is just beside the two. The only tests I did with the PL2 is charging the said power bank in USB2.0, USB3.0 and wall socket and how fast it will charge some devices. Please do note that I did the tests multiple times and I only tested charging it without draining the 20% of its remaining battery for its flashlight. Performance wise, PL2 is really great since it charged my completely drained Sony Xperia Z Ultra that sports a 3,050mAh battery for only 2.5 hours. However, it really did consume a lot of PL2’s 4,800mAH and I cannot expect to fully charge any drained smartphones with its remaining battery juice. The next device I tried charging PL2 with was Samsung Galaxy S5 with 2,800mAh. PL2 charged the said phone from zero to 100% in just 2 hours. Mathematically speaking, PL2 would still have 2,000mAh battery juice and I think it’s enough to lend the power bank to a friend who’s in need of an instant charging. With its 6,000mAh juice, I was expecting the PL2 to charge for quite long. However, it was quite fast even though I did not completely drain it. The flashlight may be activated by double tapping the power button of the power bank located at the side. The flashlight will be active for 30 seconds once activated and may be turned off by pushing the power button again. The flashlight is an awesome feature that may be used in case of emergency so it’s a plus for me even though the 20% of the PL2’s total power is dedicated to it. Unfortunately, the Luxa2 PL2 is not yet available in the Philippines but you may get yourself one at Amazon for only $54.99 with 2 years warranty based on Luxa2’s website. With its 6,000mAh juice, I was expecting the PL2 to charge for quite long. However, it was quite fast even though I did not completely drain it.